In 2000, realizing that there was a gap when it came to information about campus fire safety, I launched an online newsletter, Campus Firewatch. This quickly grew into much more than a newsletter, and from it I started an annual conference on campus fire safety, a non-profit organization, the annual National Campus Fire Safety Month campaign. The website, Campus Firewatch, has become a go-to designation for information and resources. Because of my experience in the field of campus fire safety, I have had the opportunity to work on a number of related grants for the Michael H. Minger Foundation and the People’s Burn Foundation of Indiana developing training programs, tools and resources. 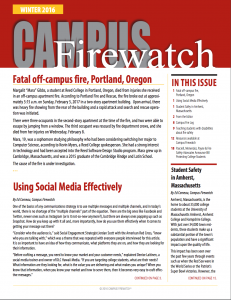 Campus Firewatch is published quarterly and distributed electronically to subscribers across the U.S., to a diverse audience that includes campus fire safety officers, fire chiefs, school administrators and more. Download a copy of Campus Firewatch.